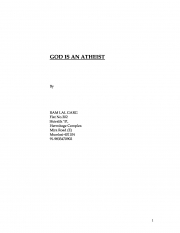 Description of "God is an Atheist (eBook)"
Post-graduate from Punjab University, Ram Lal Garg is an ex-banker, and have taken up writing post-retirement. God is an Atheist is one of his two literary narrations, the other being 'Boy with the Lantern'. Reviews of "God is an Atheist (eBook)"